Thank you so much to all who generously donated and supported our team member Sheena on the road to Relay this June. 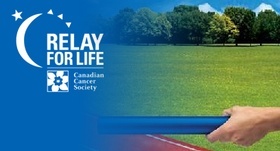 With the Canadian Cancer Society, Relay for Life helps to fund Canada’s most promising cancer research as well as support services for Canadians living with cancer. To Sheena and everyone who showed their support: we truly appreciate your efforts to make a difference. Together, we have the power to come together and do everything we can to create a cancer-free future.